New patient remote, easier to use at night, and with advanced therapy monitoring. Iowa City Ambulatory Surgical Center (Iowa City ASC) is the first center in Iowa to offer Inspire therapy. Inspire therapy is a new, clinically proven treatment option, approved by the FDA, for people with Obstructive Sleeve Apnea (OSA). 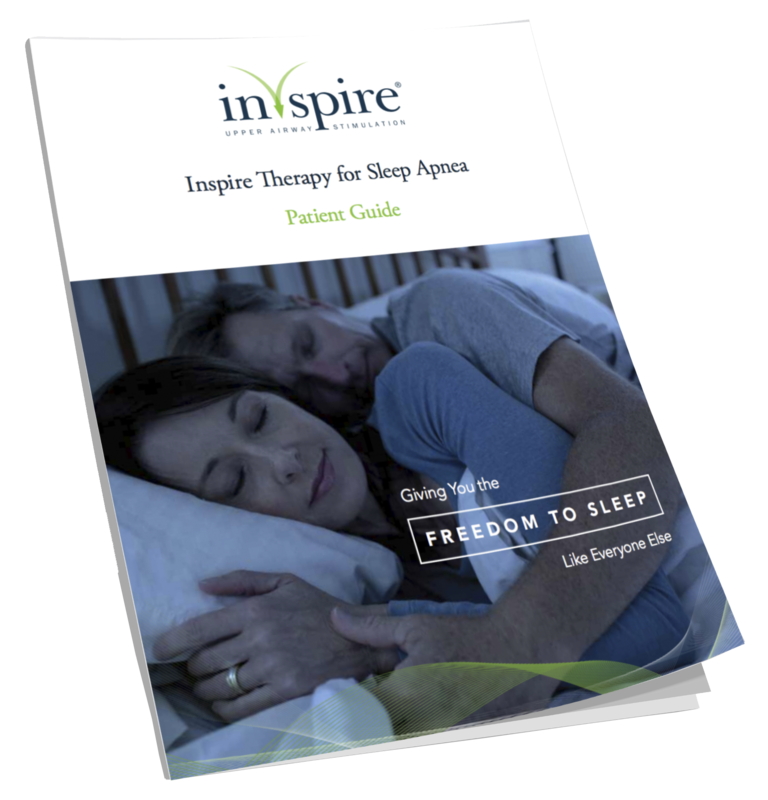 Inspire Therapy is specifically designed for people with moderate to severe OSA who are unable to use Continuous Positive Airway Pressure (CPAP). Among its many advantage, Inspire therapy is fully implanted during an outpatient procedure, does not require a mask or oral appliance, works with your body’s natural anatomy, and is simple and easy to use. Our doctors and staff are equipped to counsel and help you determine if you would be a good candidate for this treatment. Inspire therapy lets you take control of your sleep apnea and can give you the restful night’s sleep you’ve been missing. Contact our team at Iowa City ASC for more information by calling  248-1500. While you sleep, Inspire monitors every breath you take. Based on your unique breathing patterns, the system delivers mild stimulation to key airway muscles, which keeps the airway open during sleep. Using the small handheld sleep remote, you simply turn Inspire therapy on at night before bed and turn it off in the morning when you wake up. An Inspire therapy-trained doctor will evaluate your overall health status and perform a physical examination of your airway to determine if Inspire therapy might be a suitable CPAP alternative for you. If you are determined to be a good candidate for Inspire therapy, your doctor will work with your insurance company to gain insurance coverage on your behalf. This process can take a few weeks to a few months. Surgery will generally take place 1 to 4 weeks following insurance approval. Then you are ready to enjoy a quiet, comfortable and restful night’s sleep! The Inspire procedures performed at Iowa City Ambulatory Surgical Center are performed in an outpatient setting under general anesthesia. The Inspire therapy system is full implanted under the skin of the neck and chest. You may have some discomfort or swelling at the small incision sites for a few days. This is generally managed with ibuprofen or acetaminophen. Most people return to their regular diet and non-strenuous activities within a few days. Three to four weeks following surgery you will have an appointment with your doctor. The doctor will activate the implant for the first time, establish your unique therapy settings then show you how to use the hand sleep remote. One month after the device is activated, physicians optimize therapy settings for a patient during a routine sleep study. It’s also common to see your doctor once a year for a check up. Inspire therapy is clinically proven and FDA approved. There are many reasons why people choose Inspire Therapy for sleep apnea. Hear from one of Dr. Capper’s patients about why he chose Inspire Therapy. Inspire therapy is an FDA approved treatment for Obstructive Sleep Apnea (OSA). Watch the video to learn more. Inspire® Upper Airway Stimulation (UAS) is an FDA-approved treatment for people with moderate to severe OSA who are unable to use or get consistent benefit from CPAP.